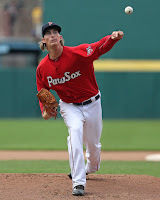 Henry Owens was "the best he's looked with his new arm slot," according to SoxProspects Executive Editor Chris Hatfield who was in attendance for the game, as the beleaguered lefty got the win. Owens allowed one run on just one hit in five innings of work, walking two and striking out four. Jeremy Barfield smacked his 22nd home run of the season. Danny Mars went 2 for 5 with a double and an RBI. Cole Sturgeon went 3 for 5 with a double and a run scored. Jhon Nunez and Victor Acosta came up with clutch back-to-back hits to key Salem's comeback victory on Saturday. Nunez tied the game on a two-run single and Acosta drove him in on an RBI double. Conrad Gregor hit his first home run since signing with the Red Sox organization, going 2 for 4 with a double, two RBI and two runs scored. Logan Boyd picked up the win, despite allowing nine hits in five innings of work. He gave up four runs, walking one and striking out two. Jay Groome was the tough-luck loser in the first game of the doubleheader, giving up just two runs in five innings of work. Groome gave up seven hits, including a solo home run, but did not allow a walk and struck out seven. There wasn't much action on the offensive side of the ball for Greenville with the three through seven hitters failing to collect a hit. Carlos Tovar was the only Drive player two record a multi-hit night, going 2 for 3. It was more of the same for Greenville in the nightcap. Daniel Gonzalez took the complete-game loss, giving up four runs (three earned) in seven innings of work. He allowed five hits, but struck out eight and walked one. Santiago Espinal went 2 for 3, collecting half of the team's hits in the game. Raiwinson Lameda kicked off the scoring for Lowell with a two-run blast in the second inning. Garrett Benge, a 13th round draft pick in this year's MLB draft, went 2 for 4 with a triple and an RBI. Top overall draft pick Tanner Houck had a tough time in his one inning of work, Denyi Reyes was stellar in relief, hurling 6 2/3 innings of shutout relief. He struck out six and did allow a walk. The GCL squad rallied to tie the game in the ninth on an Andre Colon sacrifice fly, then walked off in the tenth on a sac fly from Pedro Castellanos. A rehabbing Blake Swihart reached base four times, going 2 for 2 with two walks, a double, an RBI and a run scored. Swihart also stole two bases, putting his ankle to the test. Juan Perez impressed on the mound, striking out nine in five innings of work. He allowed one run on four hits and a walk. All of the DSL squad's offense was limited to a three-run third. Ivan Houellemont went 1 for 4 with a double, an RBI, a run scored and a stolen base. Luis Colmenares settled for the no-decision, giving up two runs on five hits in four innings of work. He struck out six and walked three. Player of the Night: Looking somewhat back on track, Henry Owens gets the nod. Owens is now throwing from a "true sidearm to low 3/4" and "frankly looked like a pitcher that'll be back up in the bigs at some point," according to Chris Hatfield. Owens' fastball ranged from 89-93 mph, touching 94, mixing in a slider and a changeup.